The iBase Technology MI961 is an Intel H61-based mini-ITX motherboard that uses the LGA1155 platforms 2nd generation Core processor family. It features integrated graphics and memory controller which increases performance and enables good video with no additional hardware. The next-generation mini-ITX motherboard provides a full-featured interface, including eight x USB 2.0 ports, two x USB 3.0 ports, four x serial ports and three x SATA II ports. Display connections are for HDMI, DVI-D and CRT while expansion slots include a PCI-E(x16) and a Mini PCI-E(x1) slot. The board also includes iSMART that improves its environmental performance. This feature includes the EuP/ErP power-saving function that limits system power consumption in any off mode, as well as the auto-scheduler that allows start/shutdown scheduling to make systems more energy efficient. 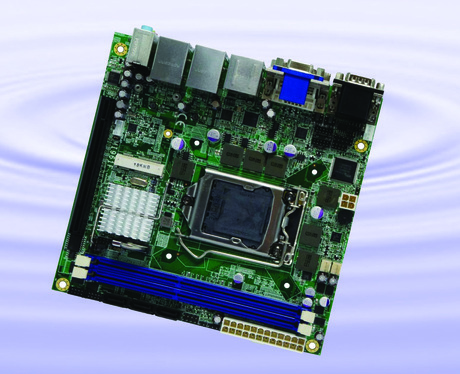 The motherboard is designed for users in the industrial automation, gaming, kiosk, POS and signage markets. I am interested in iBase MI961 Mini-ITX motherboard .